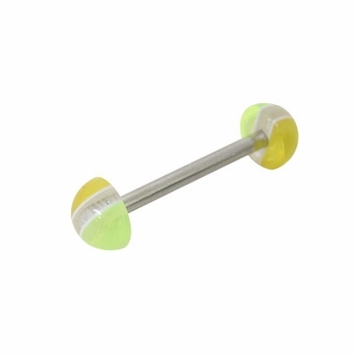 This is a fantastic barbell tongue ring with a 316L high grade surgical steel shaft and ultra violet acrylic replacement beads in half-bead design. The bead colors come in stripe Blue/Red, Yellow/Green/Clear, Purple/Red/Clear and Red. The size is available in 14 gauge 12mm-1/2, 15mm-5/8, or 18mm-3/4 of an inch. Entire piece is nickel free.